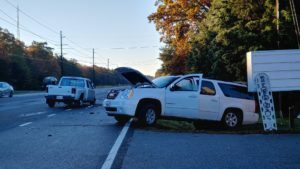 On November 7, 2018, at approximately 7:00 a.m., police fire and rescue personnel responded to Three Notch Road, and Evergreen Park Road, in Lexington Park for the reported motor vehicle accident. Shortly after crews were dispatched for the initial call, the St. Mary’s County Emergency Communications Center received multiple 911 calls reporting two vehicles in a head-on style collision, with one person trapped and unconscious, prompting an upgraded assignment. 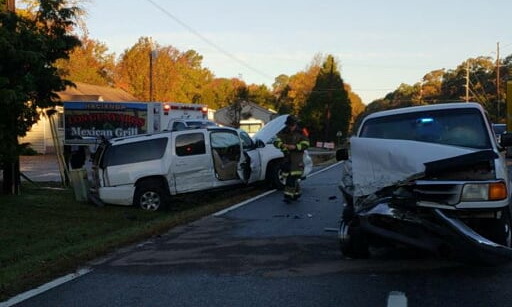 Crews arrived on scene to find a Ford Ranger pick-up truck, and a GMC Yukon XL SUV involved a head-on style collision, with one vehicle in the roadway, and one vehicle off the roadway. 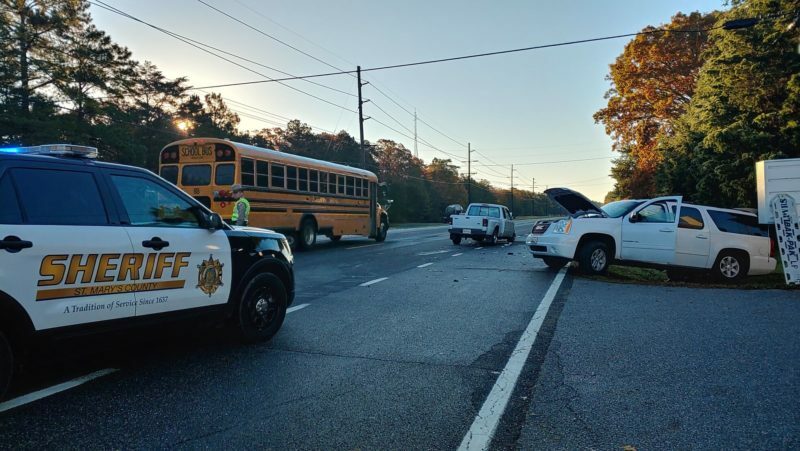 Two adults, and two pediatric patients were transported by ambulance to an area hospital with unknown injuries. Police continue to investigate the cause of the crash and updates will be provided when they become available. This entry was posted on November 7, 2018 at 10:56 am and is filed under All News, County, Fire & Rescue, Law Enforcement, St. Mary's News, Top News, z 600X120 Top Ad Bottom, z 600X120 Top Ad Top. You can follow any responses to this entry through the RSS 2.0 feed. No secret here. SPEED was a factor. People do 65-70MPH down that stretch of road every single day! Why not? Its not like SMCSO is doing any enforcement!! Get ready to see a lot more of this since Cameron was re-elected! So, speed caused the accident…not someone’s inattention to driving, or someone pulling out in front of another driver? Are you sure? Could be. But, I said speed was a “factor” in the accident. You do know what a “factor” is, right? Maybe you should look that up and educate yourself before making dumb replies. Still doesn’t change the FACT that our major roads go unpatrolled and these accident will continue to happen more and more until something is done! Ahhhh, so you have proof (video/ surveillance footage, eye witness account…) that one of these two vehicles were speeding. Be sure to provide that to the proper authorities. It’s your civic duty! Have you ever driven down that stretch of road?? I do every single day! Iam doing 55 and getting passed like I am standing still! I suppose I should get evidence of speeding down there. It’s not like the law enforcement in this area is doing it! Elections are over and I already see no patrol cars on the road anymore. Funny how they were all over the week before the election!! Yuo get what you ask for SMC! More years of Cameron. Congrats!! oh man, white on white crime. Put down the damn cel phone and drive the vehicle not your cel phone! The worst thing this country ever did was allow cel phones in cars! I think that if a driver is caught using a cel phone while driving that driver should have his or her drivers license revoked for life! Drivers should have to use pay phones set up on the side of the road for emergencies!